Cover Reads: Grant Me The Senility To Forget The People I Never Liked Anyway, The Good Fortune To Run Into The Ones I Do, And The Eyesight To Tell The Difference. With age comes grace, and the ability to cherish moments for their true value. Put a little more bluntly: It's the ability to better deduce what is important and what is BS. Our seasoned citizens may look a little clueless and out of it, but they have that senility smile on their faces for good reason. 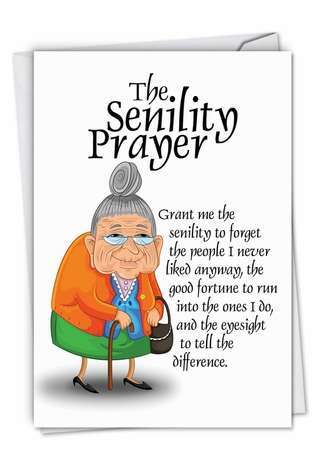 Like the Serenity Prayer, the Senility Prayer is a way for people to get through the day without losing their cool. 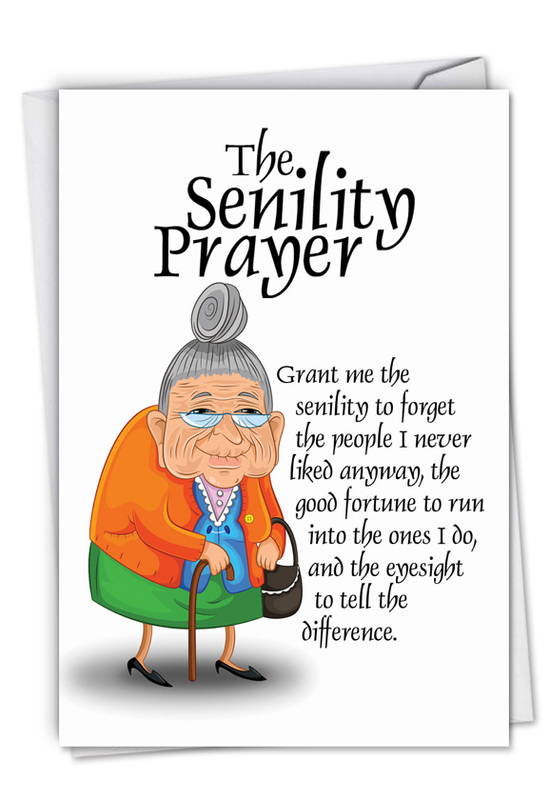 This laugh-out-loud birthday card is perfect for your aging friends. 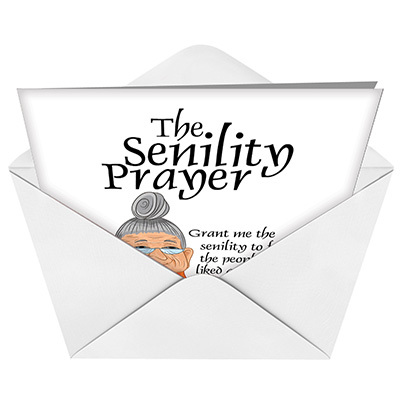 Even if they are slowly losing their marbles and memories, the Senility Prayer is an excellent way to not lose your temper. 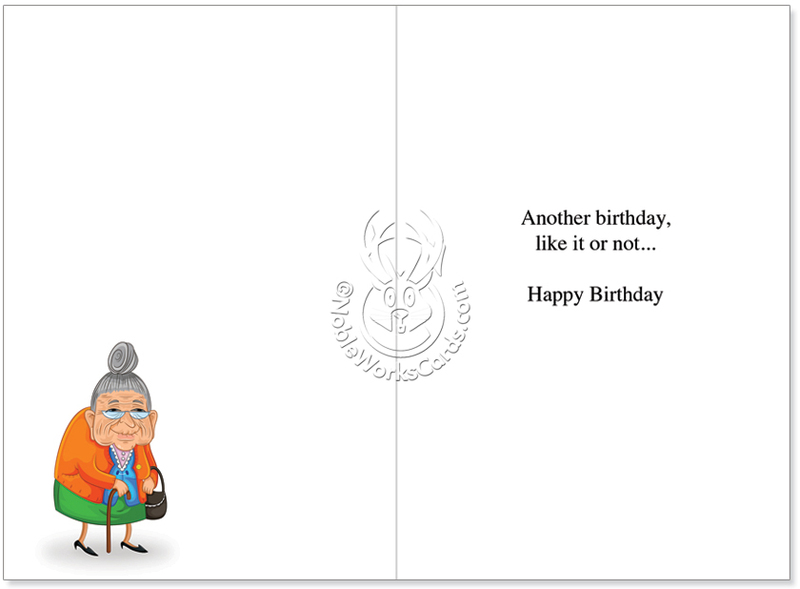 This hilarious birthday card is printed on FSC-certified paper, to help the planet last through many more aging generations. It's available in two sizes: A standard 5-by-7-inch for normal mailing and an 8.5-by-11-inch version for a bit more visibility. Some memories and people are better off forgotten anyway, so embrace your growing senility. By giving this funny birthday card, you can reassure your loved ones that it's OK to forget, especially on their birthday. I derive as much pleasure from selecting this card as does its recipient. The humor is direct and clear. It's a great card!! These cards are the talk of the Occasion..
"AWESOME, FEEL GOOD, MADE ME LOL" kinda thing when I was very upset/sad. Tnx!!! the recipient loved the card!